Who knew the ARRL radiogram could be so easy to send and receive — and so enjoyable? All those old-time NTS operators, of course! The National Traffic System — the “Relay” in the American Radio Relay League — has been around since 1915, yet never have I had the courage to take part until now. I wish I’d done it sooner. My son, a ham for only a month, has already passed two radiograms of his own! How about you? Would you like to give it a try? The first step is to find a net that is part of the NTS. I found one by searching the ARRL database (click here) for a “Section Net” in Minnesota. Unfortunately the database is a bit cluttered, so it may require a bit of patience as you sift through the listings and tune around listening for a listed net. But that’s not a bad way to start, really. Patient listening will get you far in this hobby, especially when you’re trying to learn something new. Once I found the MN Section Phone Net on 3860 kHz I listened to a few sessions before checking in. 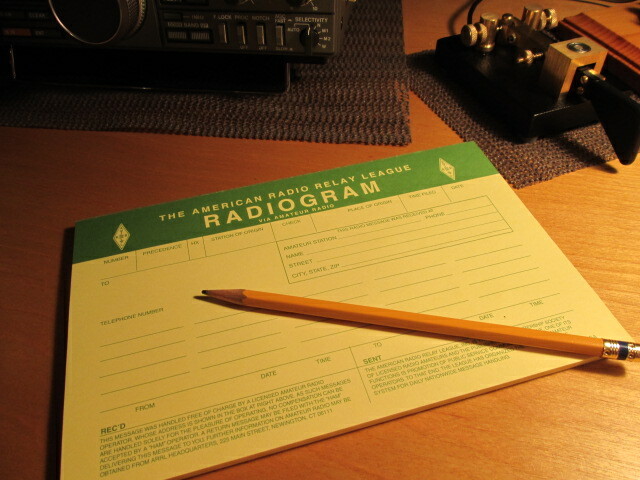 My biggest fear was that I might be asked to receive a radiogram without understanding the procedure. But I didn’t have anything to worry about — surprisingly, very little traffic is actually passed these days. The same is true of the SD NEO Net which immediately follows the MN Section net on that frequency. We need more radiograms in the system. It doesn’t matter how trivial your message is, honestly. Know somebody who has a birthday coming up? Send him a radiogram! It is a novel way to send a greeting, and it helps keep the NTS running the way it’s supposed to. As the ARES EC for my county I have a vested interest in the proficiency of the NTS, which works closely with ARES during a disaster. But I digress. To learn how to send and receive a radiogram I turned to The ARRL Operating Manual For Radio Amateurs. The chapter on traffic handling is very well written; read through it a couple of times and you’ll be ready to handle radiograms by a voice-mode. CW is a little tougher because it involves unique prosigns and Q-signals — the book is indispensable as a starting-point, but I’m still not ready to check into a CW traffic net quite yet. I’m listening when I can, though, and learning. Before passing a radiogram in the NTS, I practiced sending and receiving a test-radiogram with my son on 2 meter simplex. 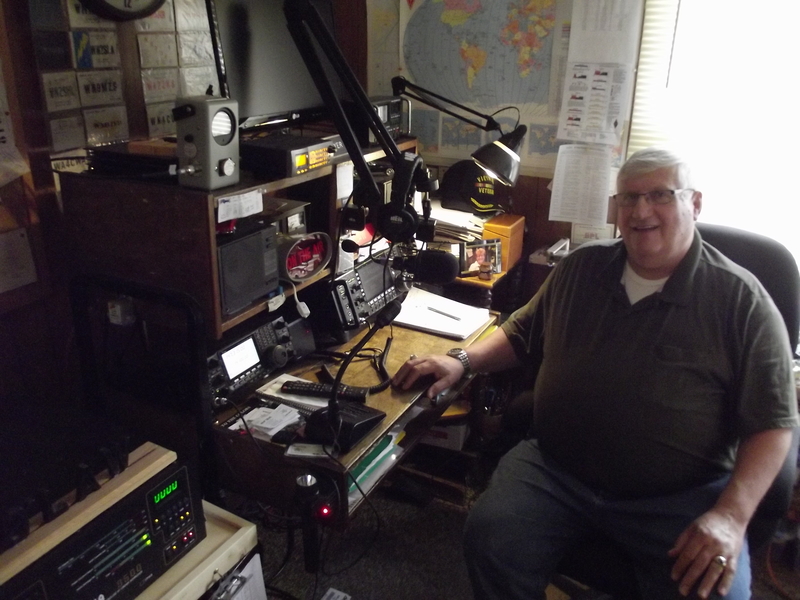 Then I practiced sending a test-radiogram to the Yellow Medicine County ARES Training Net on our local 2 meter repeater. We were ready to do it for real. On the next Training Net my son sent me a bona fide radiogram bound for his friend in Virginia. No turning back now — I couldn’t let my son down! The next chance I had to put it into the NTS was with the SD NEO Phone Net, so I tuned in, gulped, and took the plunge. Pretty soon the radiogram was on its way and I was grinning. This is easy! In my next post I’ll describe how to compose a radiogram. Obviously I’m new at this, but that also means some of these things are fresh in my mind. I hope it will help one of you get on the air and send a radiogram! Last night at 8:00 P.M. I held our first Yellow Medicine County ARES Training Net. The plan is to do this every Monday night at 8:00 P.M. and to cover a specific learning objective each time. Dean Herzberg, NYØI, graciously agreed to let us use his 2 meter repeater in Milan for this. Rather than trying to re-invent the wheel, I’m trying to mimic the Arizona Emergency Net. They have been doing some excellent work, and you can listen to recordings of their training nets online (click here for their archives). The stations who checked in did a great job. The whole net took only about 15 minutes; I tried to make it short, sweet, and to the point, and since we didn’t have many check-ins it didn’t last long. All hams within range of the repeater are welcome to participate in this net, whether or not they are in Yellow Medicine County and whether or not they have registered with ARES. I do hope that this will draw some hams into ARES, though. Now that we have something like this going, it’s time to beat the bushes by sending out letters to local hams inviting them to take part. When I moved out here several years ago, it didn’t take long before my phone rang with a radiogram delivered by Robert Meyer, WØLAW. He lives about a half hour away in the city of Marshall, and is the Minnesota Section Traffic Manager. Robert is a well-known traffic handler, consistently ranking at or near the top of the list for traffic handled each month in this state. He retired as chief jailer of the Lyon County Sheriff’s Office a couple years ago, hence his call sign. I’d never met Robert in person before, but I’ve wanted to. Having heard through the grapevine that he had just had his new tower’s foundation poured, I decided to look him up last Saturday when I was in the neighborhood for my son’s classical guitar recital. Even though my son and I took him by surprise, he welcomed us warmly and gave us a tour. What a nice fellow! Robert led us around to his backyard, a beautiful parcel of lush green grass with songbirds feeding tamely at several bird-feeders. A couple of wire antennas hung from his current tower, disappearing into some trees and a river valley beyond. The footing for his new tower, nestled up against the back of his house, was massive! As we stood there discussing antennas and songbirds, I mentioned to Robert that I’ve always wanted to handle a radiogram but have never mustered the courage to do it. He could have laughed at me, but instead he kindly encouraged me to give it a try and then invited my son and I into his house so he could find “a few things” to help me. You should see Robert’s shack! When you step inside the front door of his house, it’s in plain view — a most excellent man-cave adjoins his living room. Pretty soon my son and I were marveling at his equipment, stuff we might never see again except in catalogs! Delving into his well-organized file cabinet, in short order Robert came up with a couple of reference sheets and a booklet to help me handle traffic. He also tore off most of an ARRL radiogram pad and gave it to me, refusing to allow me to pay for it. I’m grateful for Robert’s hospitality and generosity, not to mention his labor as Minnesota Section Traffic Manager. 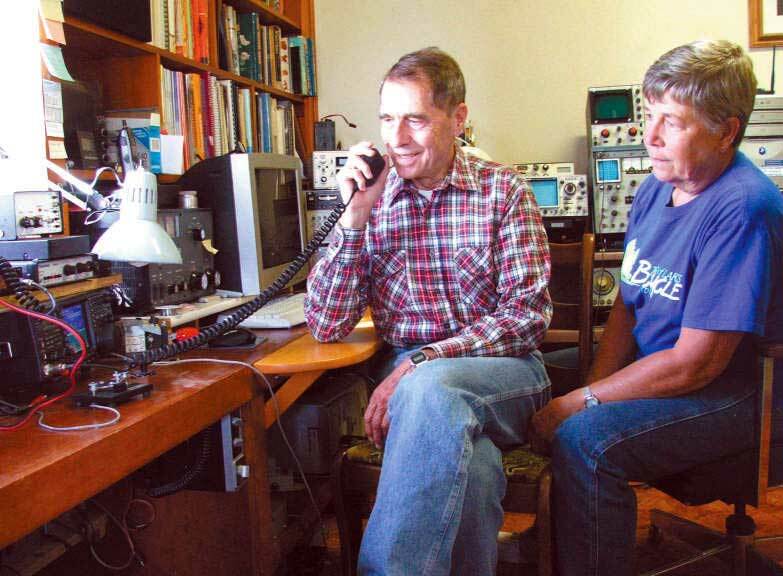 He represents a side of ham radio that has long been as mysterious to me as the dark side of the moon — QRO SSB NTS traffic handling. Once upon a time I wouldn’t have looked him up, but I think I’ve grown up a little since then. I’ve really come to appreciate the variety of people I meet in this hobby and the variety of activities they do. Once upon a time my horizon was limited; if you were on HF CW I noticed you, especially if you were QRP, but I didn’t pay much attention to the rest of the ham world. I was cheating myself. I’ve loved CW, but I’m starting to like SSB and digital modes, too. I’ve loved QRP, but I’m also starting to appreciate what QRO can do (and the skill it takes to handle it). I’ve always preferred HF, but as I get to know the local hams I’m becoming surprisingly fond of VHF FM. So I’m glad I looked up Robert, the legendary lawman — and I’m really glad he welcomed my son and I so warmly. Can you imagine getting a surprise visit from a blogger who snaps a picture of your shack for the world to see? That’s a bit much! Thanks, Robert, for being so nice to us and for being such a good sport. My online ARRL course, “Introduction to Emergency Communication,” is in full swing. I’m happy to say that it is pretty demanding. Not that the material itself has been especially difficult (yet), but the essay-assignments do require some thought — and other assignments are pushing me to do some new things on the air, like listening to several nets, critiquing an NCS (Net Control Station), and checking into a net (okay, I probably have checked into a net or two over the years, but it’s been so long that I hardly remember doing it). Today I reaped some unexpected benefits from one of these assignments. Having been assigned to check into a formal net, I checked into the PICONET this morning. This was no small feat, since it was on 75 meters. My New Carolina Windom is only cut for 40 meters, and the automatic tuner on my Kenwood TS-440S has never been able to match it — the SWR is terrible! But using my old Drake MN-7 Matching Network, I was able to match it surprisingly well. So now I’m on 80/75 meters! I even made a CW contact with a fellow in Wisconsin, and got a decent signal report. And after checking in this morning, I visited the PICONET website — and learned that Lyle Koehler, KØLR, would be the NCS for the PICONET this afternoon! Wow! Lyle is the ham who gave me my Novice code test back in 1978. I was only 10 years old, but I remember it like it was yesterday. I’ll never forget how I shook like a leaf on the couch in his living room while he sat beside me and tapped out 5 wpm code with a straight key and oscillator. When he told me I passed, I couldn’t wipe the grin off my face for the rest of the day! So the thought of talking with Lyle again after all these years was enough to make me watch the clock, eager for the PICONET to open again at 1500 CDT. And sure enough, at the appointed hour I heard Lyle’s voice as he opened the net! I was his first check-in, and I took advantage of the net’s slow start to explain that he had given me my Novice code test over three decades ago. He remembered me! What a pleasure to meet this fellow on the air after all these years.